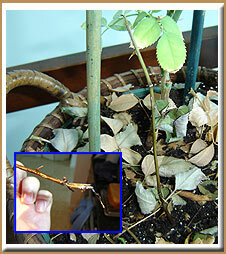 Rose branch allowed to soak in mug full of water for 3 days . Experiment intiated in Miami Beach Summer. 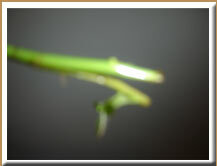 Plant resided indoors throughout course of experiment. 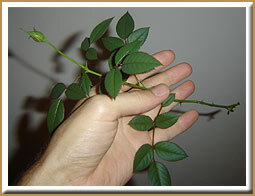 Rose branch appeared to be viable for 1 week following transplant. However, signs of withersoon soon developed. Within 2 weeks, leaves began to fall off plant. Plant was "dead" after 1 month. Extraction photo of roots taken 1.5 months after transplant. Rose branch allowed to soak for 1 week in a mug of water. Transplatation occured in Miami Beach Fall. Plant resided indoors for first month and was moved outside for remainder. 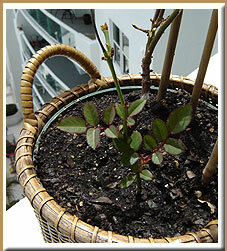 Rose branch displayed robust growth for first 3 weeks that included small leaf formation at the base of the stem. 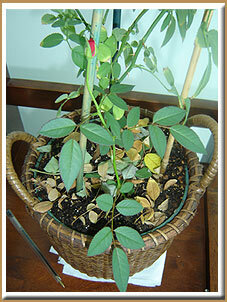 However after 1 month old leaves displayed signs of withering and within another 2 weeks have fallen off. However, after 5 months the branch appears viable. Photo on right taken 5 months after transplant.